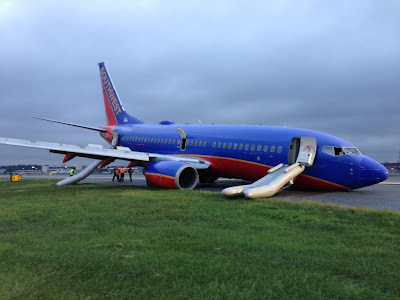 Earlier this week, the NTSB released a second update on the 22 July 2013 Southwest Airlines flight 345 landing accident at New York's LaGuardia Airport. The accident, which is being handled by the NTSB's Major Investigations Team, resulted in substantial damage to the aircraft. The initial NTSB press release on 23 July 2013 stated that the jet's nose landing gear collapsed rearward and upward into the fuselage, damaging the electronics bay. The aircraft was also damaged from sliding over 2,000 feet (610 meters) before coming to rest off to the right side of the runway. Evidence from video and other sources was consistent with the nose landing gear making contact with the runway before the main landing gear (this is the reverse of what happens in a normal landing). This was the first trip the flight crew had flown together and it was the second leg of the trip. The first officer had previous operational experience at LGA, including six flights in 2013. The captain had one previous flight into LaGuardia. On approach into LaGuardia, the first officer was the pilot flying and the captain was the pilot monitoring. The wind changed direction prior to landing, from an 11-knot tailwind when the aircraft was at 1,000 feet, to an 11-knot headwind at landing. The aircraft had been cleared for an ILS approach on runway 4 (see diagram below). The crew reported the airplane was on speed, course and glideslope down to about 200-400 feet. At some point above 400 feet, there was an exchange of control of the airplane and the captain became the flying pilot and made the landing. The NTSB has so far found no mechanical anomalies or aircraft malfunctions, and that a preliminary examination of the nose landing gear indicated that it failed due to stress overload. The NTSB has collected five videos showing various aspects of the crash landing. The team will be analyzing these recordings as part of the investigation. Should the same precaution as required by the FAA about foreign planes landing in SFO apply to non New York planes landing in LGA? Last minute changes such as wind direction, shear, deflections, etc. should warrant immediate go-around procedures. The FAA should review current regulations regarding go-arounds and maybe requiring all aircraft executing go-arounds in busy airports be given immediate priority for landing.